Cold Spray – Applied Liquid Thermoplastic. 155-180 ft. of 4-inch line per gallon at 30-35 Mils wet film thickness. Colors Available: White, Yellow, Red, and Blue. 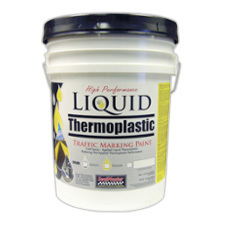 SealMaster Liquid Thermoplastic Traffic Marking Paint is a high-performance, highly durable Waterborne traffic marking material. Unique patented cross linking technology provides durability normally associated with Hot-melt Thermoplastics and epoxies. SealMaster Liquid Thermoplastics meets and exceeds the performance requirements of Federal Specification TTP-1952E, Type III. SealMaster Liquid Thermoplastic can be applied with conventional spray equipment (with stainless steel components) to asphalt, concrete, or existing road markings that are adhering well to the pavement surface. For maximum durability apply at a wet film thickness of 30-35 mils (155-180 ft. of 4-inch line per gallon). When applying at 30-35 wet mills, it is recommended that a larger particle size glass bead be used for optimum retroflectance and wet night visibility. A bead drop rate of approximately 7 lbs./gal. of paint for a 4-inch line and 30-35 mil thickness is a suitable range which can be fine tuned for optimum performance. The dry-to-no-pickup time for a 30-35 mil thickness application is typically 5 minutes or less depending on conditions. Liquid Thermoplastic can be applied with standard airless spray equipment with stainless steel components..
Read entire label before using. Be sure to wear eye protection when mixing and applying SealMaster materials. Air and surface temperature should be above 50°F during application..
View in Catalog 5 gal. Pail 72 lbs. 55 gal. Drum 800 lbs.